It was somewhere in the painful drudgery of penning an overview of a bogged down Health Care debate in Congress that I decided to chuck the entire thing and write about the new Woody Allen film, “Whatever Works” instead. In a mind-numbingly prolific and brilliant career filled with several and varied celluloid masterworks (forty-two in forty years), my favorite filmmaker, and an indelible influence as a writer and award-winning curmudgeon, has once again hit the mark. With Hollywood mired in a string of regurgitated formulaic schlock and even the independent sources beginning to repeat the same dark, gut-wrenching themes, Allen has continued to present a freshly consistent string of darkly funny, thought-provoking satires on the human condition and modern society at large. It is a theme Allen has mined many times before in “Stardust Memories” (1980) and “Deconstructing Harry” (1997), but not nearly as sharply contrasted to whatever happens around him. Allen beautifully juxtaposes Yellnikoff with his beloved New York, where people are alive, creative, romantic, and almost goofily optimistic in the face of his smarmy despair. It is no coincidence the protagonist subsists in a basement hovel imprisoned in the expanding corridors of China Town, an aging Jewish academic, railing against the failures of Western culture, politics, and art in the shadow of an emerging Eastern empire. Even when a young, naïve southern girl in the grand tradition of Eliza Doolittle winds up on his doorstep begging for sustenance, which eventually brings her overtly myopic Bible-thumping parents – all eventually embracing the city’s freeing Bohemian temptations and finding true happiness in self-realization – it has absolutely no affect on Yellnikoff, save for providing fodder for his condescending wise-cracks along the way. It is here where the casting of David as Yellnikoff is simple perfection. 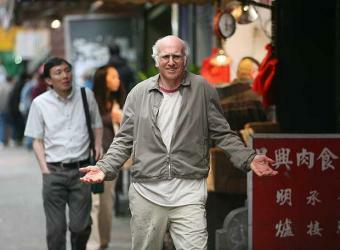 His legacy as co-creator of the torturous craziness in Seinfeld and his successful HBO stint with the consistently amusing Curb Your Enthusiasm, wherein everyone is duped, pissed, and unnaturally selfish to the point of megalomania with no redemption or learned experience in sight puts him in Allen’s unblinking spotlight. He is relentless, dour, condescending and yet a weirdly relatable composite of Groucho Marx and Dostoyevsky’s Ivan. Among several stellar performances in the film is the southern triumvirate of Ed Begeley Jr., as the easily tempted moral patriarchal poser, his overly dramatic and perpetually flustered ex-wife, Patricia Clarkson, and their wide-eyed belle of a daughter, Melodie, who is the adorable antagonistic foil for Yellnikoff, played with great empathy and wit by Evan Rachel Wood, following in the footsteps of such Oscar-winning female luminaries as Diane Keaton, Diane Weis, Mira Sorvino, and Penelope Cruz. For Yellnikoff and quite frankly his author, Melodie represents the random lunacy, unpredictability and splendor of life’s little joke; how two completely disparate personalities in age, intellect, sensibility, and geographical origin, can meet up and imprint their character on one another, spiking holes in the film’s otherwise dimly comical skepticism. This is not unlike Allen’s own bizarre courtship with Soon Yi Previn, the adopted daughter of his ex-lover, Mia Farrow. There are also the many and varied classic Woody Allen twists and turns, strangely formulated encounters and plenty of laughs in “Whatever Works”, which may not be his best work but an uncanny synopsis of his most celebrated films’ general philosophy – life is filled with one frighteningly random chaotic pratfall and unexpected disappointment after the other, but sprinkled with just enough humor, love, art, and exciting distraction to keep us from snuffing it.